Japan's rapidly aging society is spurring technological innovation, including the use of a tracking system designed to help families and nursing facilities locate people suffering from dementia when they lose their way or go missing. As the country with the most aged population, Japan is poised to see its postwar baby-boomer generation -- the biggest age demographic -- form a population stratum aged 75 or older by 2025. With the help of a smartphone app, thumb-sized portable electronic devices developed by Sohgo Security Services Co., popularly known as ALSOK, that can be placed in a pocket, wallet or attached to a shoe are expected to quickly find those suffering from dementia who go missing. The system works using Bluetooth wireless technology -- the standard for exchanging data over short distances. It might be difficult for a resident of a community to notice a person suffering from dementia who is simply wandering the streets. But if the elderly person is carrying the gadget, dubbed "Mimamori Tag," and passes a volunteer who has downloaded the free app to a smartphone, the positioning data of the person who has gone missing is automatically sent and stored on ALSOK's computer servers. The system also features tabletop detectors that would be installed at local business. These can also pick up the signal and store the data on ALSOK'S servers. As the data is sent anonymously, there is no concern about leaking private information. Family members or those conducting the search can then find the elderly person by checking the stored data via the app, and pinpoint the location and where the person is headed. As more people download the app to their smartphones and more tabletop detectors are employed, so the amount of data stored will increase, it makes it easier and quicker to find the missing person. The Mimamori device -- mimamori means "watch over" in Japanese -- is much less cumbersome and lighter than a typically fist-sized GPS gadget, commonly used by hundreds of municipalities across Japan for the same purpose. In a trial conducted in the southwestern Japan city of Kitakyushu in January, the security service company "obtained a good result," according to Daiki Shimamura, an ALSOK official promoting the system. Two search teams consisting of six people each were both able to find a person holding the device inside 10 minutes within a 2-kilometer square area, assisted by 30 tabletop detectors. It took dozens of people about 30 minutes to search for a person without using the system. The test subjects were not actual dementia patients. ALSOK'S devices are expected to be sold to municipalities for 2,200 yen per individual, plus 200 yen per month for the use. The tabletop detectors cost 23,000 yen per unit and can be rented on a monthly basis for 1,400 yen. ALSOK is aiming to begin commercial sales of the equipment and devices before the spring of 2018. The number of persons who went missing due to dementia jumped 27.1 percent to 12,208 in 2015 from 2012, accounting for 14.9 percent of total missing persons, according to the National Police Agency. The figure is expected to rise further as the ratio of elderly people -- those aged 65 or older -- in the population is forecast to reach 40 percent in 2060 from 26.7 percent in 2015, according to a projection by the Cabinet Office. Anticipating demand, Eisai Co., a Tokyo-based pharmaceutical firm that has developed medications for dementia, has created a similar device to ALSOK's with a Tokyo-based technology venture. The two companies are conducting trials in a number of municipalities and plan to begin commercial sales, also before the spring of 2018. Tama, located in suburban Tokyo, began employing ALSOK's system in April to support elderly residents and their families following the decision by the infrastructure ministry to adopt the service for pilot projects around the nation. Tama will receive government subsidies until 2019, a way of promoting the business model to help make the local community more livable for the elderly. The city encompasses part of Japan's largest residential development, Tama New Town, which was developed from the mid 1960s during Japan's era of high economic growth in response to the rising demand for affordable housing for people who commuted to central Tokyo. The town occupies 60 percent of the city's total land area today. About two-thirds of the community's population of some 150,000 is living in the residential town. According to the local government, the ratio of persons 65 and over was 29.4 percent in March, higher than the national average. Tama represents a prime example of the task that faces the nation. One in three people in the city are expected to be at least 75 years old in 2025, as all the baby boomers who were born between 1947 to 1951, about 8.5 million, will have reached that age around then. Since 2006, Tama city has expanded its budget for elderly care, including building networks to closely watch seniors in accordance with the central government's policies for promoting support measures for the elderly, particularly for dementia patients. The state has been raising awareness about dementia, estimating the number of patients will grow to 7 million in 2025. 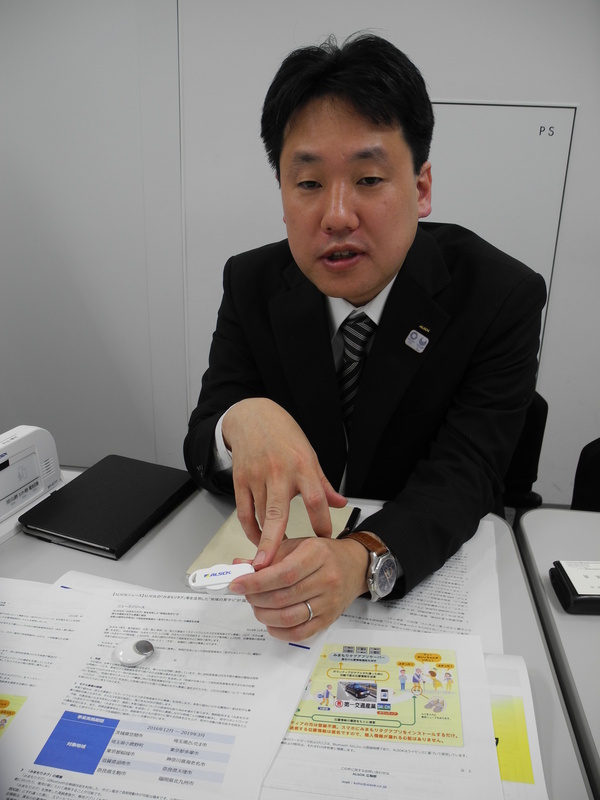 Over 2,000 Mimamori Tags are being provided for use in 10 cities nationwide by ALSOK, including Inagi, a city adjacent to Tama that is cooperating in the effort. "Elderly residents come and go across city borders to visit hospitals in both cities, sometimes by train. We can prepare to care for those in need by using the system," Koji Takeda, a Tama city official, said. The hope is that Tama's effort to support the elderly and ALSOK's detection system will create a synergy effect in the community. Twenty-three companies and organizations, including Seven-Eleven Japan Co., the leading parcel delivery service Yamato Transport Co., post offices, nonprofit organizations, co-op supermarkets, and care service providers, have agreed to cooperate. "We call on (these companies) to voluntarily download the app into their employees' smartphones in addition to placing the tabletop detectors at a number of their bases," Takeda said. Additionally, the city is also seeking the help of hundreds of senior citizen volunteers in Tama who regularly clean public elementary and junior high schools and various buildings across the city to participate in the neighborhood watch. "If many of them cooperate by downloading the app, we could have a very reliable network to detect the elderly that covers the entire city," Takeda said.